MELANIE Phillips want to talk to Daily Mail readers about “one of the most cynical aspects of political correctness is the way in which its edicts purport to be in the interests of minority groups”. The latest manifestation stars once again that all-time world champion of political correctness, the BBC. Apparently, it has decided that the terms AD and BC (Anno Domini, or the Year of Our Lord, and Before Christ) must be replaced by the terms Common Era and Before Common Era. The BBC’s Chief Commissar for Political Correctness (whom I imagine as a tall, stern young woman in cruel glasses issuing edicts from an austere office) was hard at work again last week. On University Challenge, Jeremy Paxman referred to a date as being Common Era, rather than AD. This nasty formulation is designed to write Christianity out of our culture. 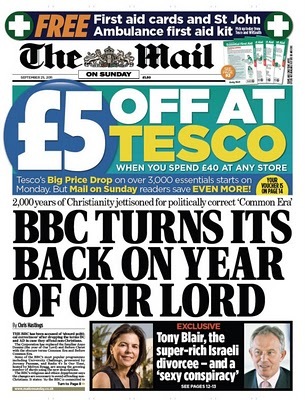 The BBC has been accused of ‘absurd political correctness’ after dropping the terms BC and AD in case they offend non-Christians. The Corporation has replaced the familiar Anno Domini (the year of Our Lord) and Before Christ with the obscure terms Common Era and Before Common Era. Well, the BBC thinks you should and it is taking action on your behalf. No longer will its website refer to those bigoted, Christian-centric concepts AD (as in Anno Domini – the Year of Our Lord) and BC (Before Christ). From now on, it will use initials which strip our traditional Gregorian calendar of its offensive religious context. All reference to Christ has been expunged, replaced by the terms CE (Common Era) and BCE (Before Common Era).